This little publication consists of two learned papers, one authored by Professor Daya Krishna, a modern philosopher thinker of high eminence and the other by Acharya Mahāprajña, a saint philosopher and head of the Terapanth sect of Jainism, credited with an encyclopaedic knowledge on Jainism. Professor Daya Krishna, in his paper, 'How Anekāntika is Anekānta 'appearing in the Journal of Indian Council of Philosophical Research January-April 199 9 issue, raises a host of searching questions about the concept of Anekāntavād which, perhaps, have never been asked in the past. His treatment of the subject from a modern critical angle puts it in a new perspective. He maintains that the term 'Anekānta 'has an ambiguous meaning and if it connotes that no finite set of predicates can ever exhaust the nature of reality, there is nothing extraordinary about this contention. He asks whether reality is anekāntika for a Sarvajña i.e. an omniscient being like Lord Mahavira also ? If it is so, then the doctrines of syādvād and SaptabhañgīnayawiW not hold in his case. If it is not so, then the doctrine ceases to be ontological in character. He contends that reality of an object never appears ekāntikato an ordinary being, finite and imperfect as he/she is. He holds that apprehension is always intrinsically anekāntika in character and not ekāntika as the Jainas seem to believe. As modern Science and Vedānt too maintain, all ordinary things are specific forms of the ultimate reality, the anekāntika character should apply to the ultimate reality as well but the doctrine for the Jainas stands for ordinary things also that we perceive. A thing has actual properties as well as possible ones but the ontological status of a determining unactualised possibility has never been seriously discussed in the Jain literature on the subject. The Jain thought on Anekānta not only ignores all the complexity related to the actual and the possible, it also fails, according to the Professor, to come to grips with the notion of 'impossible ' (eg. square circle) which sets a limit to the anekāntika character of Anekānta. He points out that Lord Mahavir, has made definite pronouncements in respect of space and dravya, kāla and paryāya about which there can be no anekāntikatā. Finally, he thinks that the issue of anenkāntikatāw\\\ have to be disengaged not only from doctrines of syādvāda and saptabhañgīnaya, but also from the way Jain thinkers have thought about it. These questions undeniably, very penetrating, touch the deepest depths of the issue at hand and call for clarification by one who is conversant with the subject most authoratively. 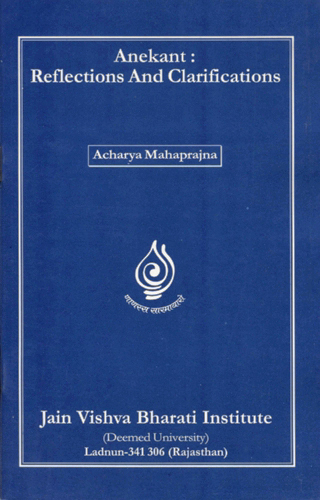 The great Acharya takes up the issue point by point and explains the intricacies in a comprehensible manner by giving illustrations drawn from ordinary experience. He cites the authority of the texts extensively and with a natural ease to buttress his standpoint. He confronts the paradoxes and subtleties of a groping intellect with the transparency and revelations of a steady wisdom. The reader, interested in Jainism, one hopes, will be benefited a great deal by going through these two learned articles as they embody the reflections of two great minds on the philosophy of Anekānta and the related concepts of syādvāda and saptabhañgīnaya.